Castiglione Thermal Park is a few hundred meters from Hotel Gemma. This thermal park in Ischia is an oasis of well-being, relaxation and nature. The park is home to several thermal pools which accomodate guests at different temperatures. From the large pool of sea water to Kneipp therapy, Castiglione Thermal Park offers a pool for every need or preference. The natural sauna, the cutting edge beauty department and two excellent restaurants complete the offering at Castiglione. At the thermal park, guests of Hotel Gemma may, in addition to enjoying the wild beauty of the place also take advantage of the different health and beauty treatments with private health insurance concessions. Castiglione consists of ten large pools. In eight of these pools the water temperature varies from 30 to 40 degrees centigrade. In addition, an Olympic pool of 25 × 14 meters is powered by seawater, creating a magical atmosphere. Castiglione houses many facilities and offers a wide range of services, including a beauty farm, several pools with jacuzzi, a Kneipp pool, a private beach and a natural sauna. Even the setting in which it is located is particularly pleasant, as Castiglione is located in a sort of natural basin and is surrounded by a lush park. The visitors, surrounded by greenery and pampered by the thermal water, find themselves in an oasis of peace and tranquility in which to relax and release the stress of contemporary life. In the departments dedicated to thermal therapies you can enjoy various treatments to cure respiratory, musculoskeletal, circulatory and skin diseases. Among the many spa treatments available there are baths, mud baths, aerosol, inhalations, physiotherapeutic massages and special treatments for healthy skin. Ancient literature is full of references to Castiglione and its healing properties, such as Strabo, Pliny, and the famous Calabrian doctor Jasolino, just to name a few. Castiglione Thermal Park is open from April to October. The O ‘Vagnitiello Hydrotherapy Park was founded around the famous hot spring of Bagnitiello in the 1950s. This unique source is characterised by thermal waters that flow directly into the sea of Casamicciola. These waters have been renowned since ancient times for their extraordinary healing properties. The park has four pools of various sizes: the largest is the swimming pool, while on the slopes, surrounded by plants and flowers three more small pools with jacuzzi are located. The park also has a large natural sauna. 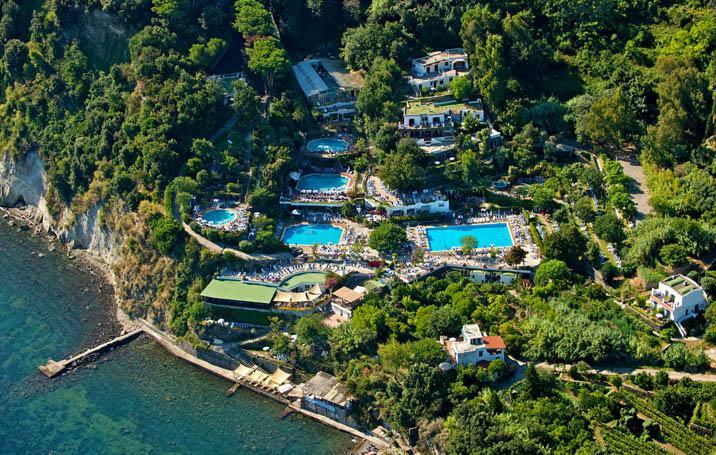 Safely book your holiday at our 3 star hotel in Ischia, Hotel Gemma! 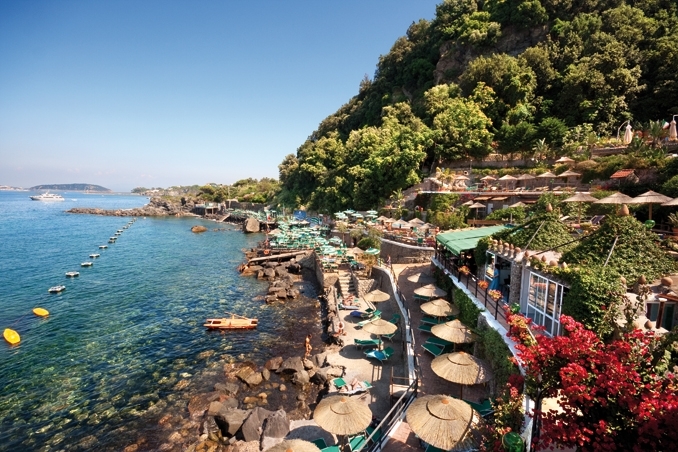 A 3 star hotel in Ischia, Hotel Gemma is located in Casamicciola Terme, one of the six municipalities on Ischia Island. Hotel Gemma is a small oasis where you can find harmony and relaxation, thanks to a warm welcome, typical of family-run establishment. Hotel Gemma has a long tradition of success in the tourism sector that has been handed down for several generations. In a central location it offers guests the opportunity to reach the centres and marinas with ease and speed. Transparency, warmth and naturalness: here are our values. Please come to the Hotel Gemma to experience with us your special holiday in Ischia! Ischia is a beautiful island in the Gulf of Naples boasting: sea, culture, monuments, gastronomy, events and thermal resources. Ischia is a perfect blend for those who want an intense and varied holiday, but also for those who simply want to enjoy a break in the pursuit of well-being. Near the Hotel Gemma there are Castiglione Thermal Park and O' Vagnitiello Hydrotherapy Park, two oases of health, relaxation and nature. The parks are home to several swimming pools and offer various therapeutic treatments. For those who love the classic holiday combination of sun and sea, Ischia is full of beautiful beaches, all characterised by a beautiful natural scenery.